American League: Andrelton Simmons (SS, LAA) has always had elite bat-to-ball skills—his 90% ct% since 2015 leads all of baseball—but he has just a .265 career BA to show for it. After years of quiet contact, Simmons upped his power game in 2017 with modest gains in hard-hit rate, PX/xPX, and xBA. With a heavy GB%/LD% batted ball profile firmly in place, Simmons' BA base is strong; all he needs is a touch of h% luck to flirt with .300, or more. National League: Like Simmons, Joe Panik (2B, SF) rarely strikes out and has a similar GB/LD combo that cements a rock-solid BA foundation. His average has been all over the map the last few seasons—.312, .239, .288—but that center point (2016) was a complete mirage driven by a 25% h%. Panik shouldn't offer much in the way of counting stats, but if he can carry some elite 2H plate skills (92% ct%, 23% LD%, .291 xBA) into 2018, he'll be a surprise contestant for the batting title. Get the 2018 season started off on the right foot! Access articles like these and our diverse range of tools with a subscription to BaseballHQ.com. Winning. Fantasy Baseball. Insight. AL: Sure, we're toeing the line between speculative and crazy, but: Leonys Martin (OF, DET). He hasn't hit .250 since 2014 and he spent much of 2017 at AAA-Tacoma, but he's already made a couple leadoff appearances for a Detroit team that has no aspirations of contending in 2018. Martin, 30, still has elite Spd and it's easy to forget he posted back-to-back 30-SB seasons in 2013-14. He'll have trouble hitting lefties and will set you back in a few categories, but if DET lets Martin run—and there's little reason not to—the volume could be there for a sneaky SB breakout. NL: A move to Marlins Park is often viewed as death to one's fantasy value, but not for speedsters. Dee Gordon swiped an MLB-leading 60 bags atop Don Mattingly's lineup in 2017, could Cameron Maybin (OF, MIA) do the same? Maybin racked up 33 SB in just 395 AB last year, so this may not be much of a longshot, but his preseason 329 ADP lagged well behind other elite runners. If Maybin can stay in the lineup, his elite speed (140 RSpd since 2016), sufficient plate skills (10% bb%, 78% ct%), and likely green light give him a shot at 40+ SB. Maybin's "F" health grade is the major obstacle here. 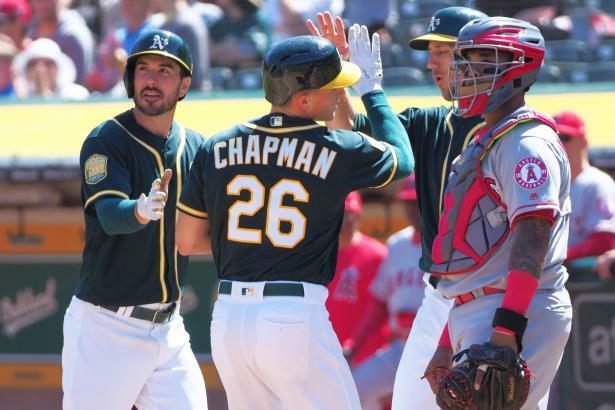 AL: A certain Bronx duo might make this an unfair fight, but Matt Chapman's (3B, OAK) rookie-season power display (14 HR in 276 2H AB) wasn't too shabby either. Chapman has the raw power skills that are ripe for the HR crown—he was one of three players with a 50% FB% and 150+ PX in 2017 (min. 200 AB; Napoli, Gallo). Oakland isn't the best place for RH power, but Chapman's defense secures him everyday playing time, and he held a respectable 76% ct% after August 1 last season. Chapman's still a BA liability, but if he holds some of those contact gains, there's a real shot for him to outpace The 2018 Baseball Forecaster's "UP: 30 HR" speculation. NL: Trevor Story (SS, COL) hasn't yet reached 30 HR in a major league season, but don't pin that on a lack of skill. Story's uppercut stroke (48% career FB%), elite hard contact (177 xPX), and homer-friendly home digs create the perfect storm for a run at 40+ HR this season. There's a ton of swing-and-miss in Story's game and all those fly balls severely cut his BA ceiling, but the HR upside is scary if he can stay on the field. AL: Chris Sale? Corey Kluber? Nah; the speculative call goes to Mike Clevinger (RHP, CLE). Despite some control issues, the 27-year-old dazzled with a 10.1 Dom over 122 MLB innings in 2017. Our own Brant Chesser recently noted that Clevinger did it with three elite swing-and-miss pitches: a slider (23% SwK), curveball (21%), and change-up (19%). He's yet to throw 160 innings in a season, but if Clevinger can stretch out that raw stuff over a full season, he'll have a decent shot to eclipse 200 strikeouts. NL: Luis Castillo (RHP, CIN) raised eyebrows in the Forecaster with an "UP: 3.25 ERA, 200 K", and his draft price (92 ADP) went through the roof. Coincidence? Despite the preseason helium, Castillo has all the makings of an ace, and it could materialize quickly. His upper-90s fastball and devastating change-up (23% SwK in 2017) give him a one-two punch that should keep the K counters active all season long. Workload shouldn't be much of an issue for Castillo either—he threw 170 innings across two levels in 2017. AL: Is it within Speculator rules to pick the same guy as last year? Lance McCullers' 4.25 ERA was awful on the surface, but a 3.15 xERA says he was far better under the hood. We spent time on McCullers last week in this space, so we'll opt instead for rotation-mate Charlie Morton (RHP, HOU). Morton's late-career velocity spike and killer curveball drove some major skill gains in 2017 (11% SwK, 10.0 Dom), all while generating another elite GB% (52%) and making strides with his control (3.1 Ctl). Qualifying for the ERA title will be his biggest obstacle—he hasn't done it since 2011—but the new new-look Morton should produce some excellent ratios. NL: Zack Godley (RHP, ARI) delivered one of the more surprising breakouts of 2017. We think he can be even better. Godley ramped up the use of his curveball (58% GB%, 23% SwK) that was one of the better pitches in baseball last season, while a 3.37/3.33 ERA/xERA split says this wasn't a luck-fueled fluke. Gravity is a powerful force, but Godley's skill-supported transformation hints at a stellar encore; an assist from the humidor might be all he needs to contend for an ERA title.